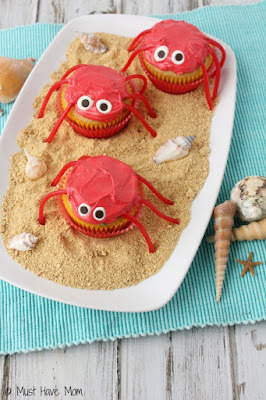 If you are searching for an adorable decorative cupcake for your beach theme party, you will love these cute crab cupcakes by Sarah from "Must Have Mom". You might not want to meet a real crab, but anyone would enjoy "meeting" and eating these precious cupcakes. Their big eyes seem to draw you in and make you want to lick the frosting right off their backs. Somehow I can just imagine little boys pulling their legs off first and eating the licorice strings. Of course, there are always a few children at any party who are hesitate to eat anything made in the image of any creature. I do recommend having a few complimentary plainly decorate cupcakes on hand for the kids who want to save the crabs. In her article, Sarah takes us step by step through the process of decorating these fabulous crab cupcakes. She includes lots of photos, which makes it even easier. You barely have to read anything because you can easily see how to assemble the crabs. I like the simplicity of her design. Because it is so easy, you could even include the kids in the decorating as a "before the party" special event. This allows you the opportunity to teach kids to use their own imagination to design and make their own fun food. It also makes for great memories for you and the children. If they are older kids, perhaps all you will need to do is act as the photographer. That can be as much fun as actually helping decorate the cupcakes. Regardless of whether you make these cupcakes by yourself, or with help, the cute crab cupcakes are sure to be a hit with your guests! So grab some cupcakes, frosting, licorice strips, and some mini chocolate chips and start decorating your fancy crabs for your family and guests. This is a fun thing to serve especially this summer. The writer(s) for Fun Food Guide do receive affiliate monies if visitors to this blog click on an affiliate link for Amazon.com or other companies, such as Zazzle, Etsy, Ebay and more. This site is intended for use by persons who are 18 years or older. We do not solicit nor knowingly collect any information from anyone under 13 years of age. You will find me in many places online. As a writer, I share reviews, recipes, crafts, gardening tips & more. My real name is Cynthia, but online I am known by my writing pseudonym, Sylvestermouse. That pen name was selected many years ago and I continue to use it on all writing platforms. The writer(s) for Fun Food Guide are participants in the Amazon Services LLC Associates Program, an affiliate advertising program designed to provide a means for sites to earn advertising fees by advertising and linking to amazon.com. © 2010 Fun Food Guide™ ~ ALL RIGHTS RESERVED ~. Powered by Blogger.